DAMASCUS, SYRIA (2:00 A.M.) – Israel is likely in direct military talks with jihadist commanders in Quneitra province whom have now established a joint operations room for the ongoing border offensive against the Syrian Arab Army (SAA). Preempted by supportive Israeli airstrikes earlier in the day, Hay’at Tahrir Al-Sham (HTS) and Free Syrian Army (FSA) factions attacked SAA positions around Baath city and overran multiple points, leading to the capture of the Mashtal Al-Zohor area on Saturday afternoon. 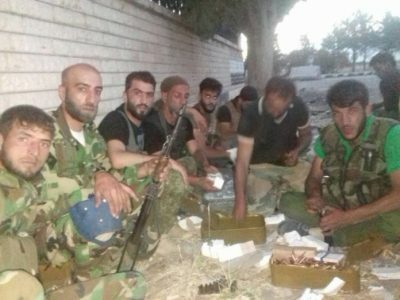 In the evening however, the SAA regrouped in Baath city and mobilized all its military capabilities for a swift counter-offensive which saw government troops retake all lost points within a couple hours, thus driving the jihadist militants back to their initial positions. Amid the skirmishes, at least 20 jihadist militants were left dead on the battlefield while 1 tank and 1 technical were destroyed, a military source told Al-Masdar News. Throughout the waves of insurgent attacks and following SAA counter-offensive, rearguard Syrian artillery units pounded the hostile jihadist belligerents. With the tables suddenly turned in favor of the Syrian Government, the SAA is currently encroaching upon long-standing rebel heartland on the border with Israel. In turn, this could prompt Tel Aviv to launch fresh airstrikes against the SAA. On Saturday afternoon, the Israeli Air Force destroyed two SAA tanks at the Municipal building area on the outskirts of Baath city, rendering it an easy target for rebel forces whom seemed well-prepared for offensive operations ahead of the Israeli sorties, suggesting at least tacit cooperation between the two parties in the face of a common foe.